It doesn’t matter if you are a new business or are ready to expand, security should be your top priority. Space management is always an issue, as many commercial buildings have limited land. One solution is to invest in a modular guard shack to help keep your property secure. Guard shacks are a cost-effective way to add check points, security offices or storage to your land. Working with a company like Panel Built will help you make sure that you have modular guard shacks that fit your needs perfectly. What is a Portable Guard House? Portable guard houses are small buildings that are often found in the entrance ways of commercial buildings, typically before the parking lot. They work to stop people before they enter a restricted area. Larger companies will often have multiple guard houses throughout the property and additional check points at the entrances of buildings. Guard booths usually have at least one attendant inside that can help visitors or give directions. The interior will have everything they need to do their job, so their post is never abandoned. Larger guard houses may even include a bathroom or surveillance area. There is a lot of debate over what makes the perfect portable guard house. If you want to be able to reap all of the benefits of prefabricated security guard houses, you should consider purchasing a modular design online. Buying the building pre-assembled cuts down on labor costs and allows you to get the security booths without having to worry about messy construction. The goal of guard booths available online for sale is to work with your current layout to improve functionality. Guard houses are useless if they are impossible to access or take up too much space. Companies like Panel Built are able to help you find a modular style that helps you accomplish your goals. 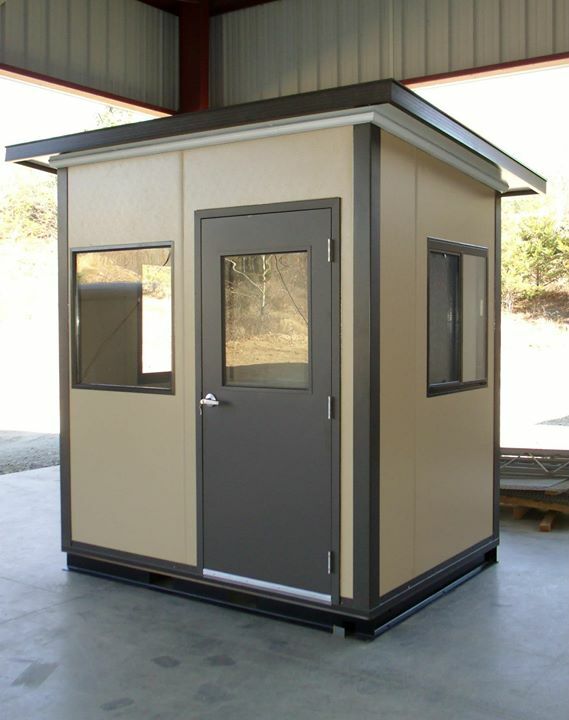 Your modular guard house is shipped directly to your work site without any fees or mess. This allows you to get back to work right away, no matter where you choose to place your new building. Once you no longer need your prefabricated guard houses, your company can move or sell the pieces. Prefabricated guard houses can be placed on the interior or exterior of your location. The guard houses are easy to lift and move. The modular building doesn’t need to be disassembled in order to be moved. One of the biggest benefits of a modular guard house is that it is highly customizable. There are a number of different window and door designs that can create a unique appearance. You will be able to match a company color scheme or the local architecture for a seamless and professional look. Aside from looking great, your security booth will help give you peace of mind. The large space is perfect for a security team and can help serve as a checkpoint. This makes it harder for people to just wander into your work site or office after hours. It can also act as a deterrent, cutting down on vandalism or theft. Companies that sell security booths online are very flexible and will work with you to meet your needs. A high quality security booth can be a great investment for your company. Every industry needs to think about security. Whether you own a factory, retail outlet or a construction site, creating checkpoints throughout your property is crucial. The company that you choose to work with may be able to provide you with great examples of how security can be improved by adding guard houses. Your gate house can help your security team do their job more efficiently. Large guarded buildings serve as the team’s office space or storage. Break rooms can be attached as well. If necessary, the modular style allows for a second floor to be added to the guard house for additional space or as a lookout post. This serves as a base for your security team. Because your security team has everything they need at their disposal, they are able to better respond to emergency situations. If they spot unwanted activities, they know where to find all of their tools to correct the situation. Panel Built is known for creating unique guard booths and allowing people to make their purchases online. They can easily build the typical booth with sliding teller windows and a glass door. Their expertise allows them to create more advanced features as well, such as larger windows or bigger roofs to provide more shade during the day. Another benefit of working with Panel Built security booth company online is their quality. All of their products are weather resistant. The materials have also been treated to withstand some signs of age, such as rust. This gives companies an overall better investment. If your company is ready to start getting the most out of their available space or you want a practical way to increase security, contact Panel Built today. 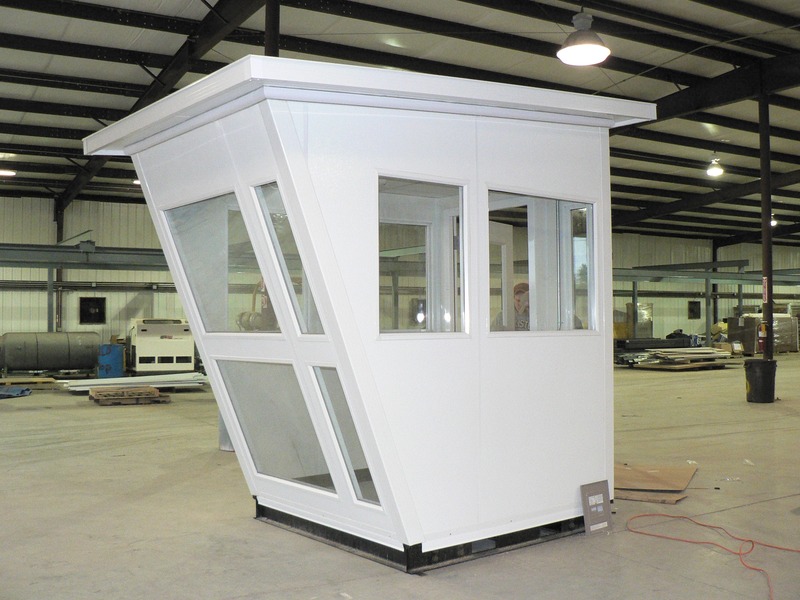 You will be surprised by the amount of skill and effort put into each modular guard house they create. Contact them today to learn more about their construction methods or how you can get custom guard houses in just a few days.